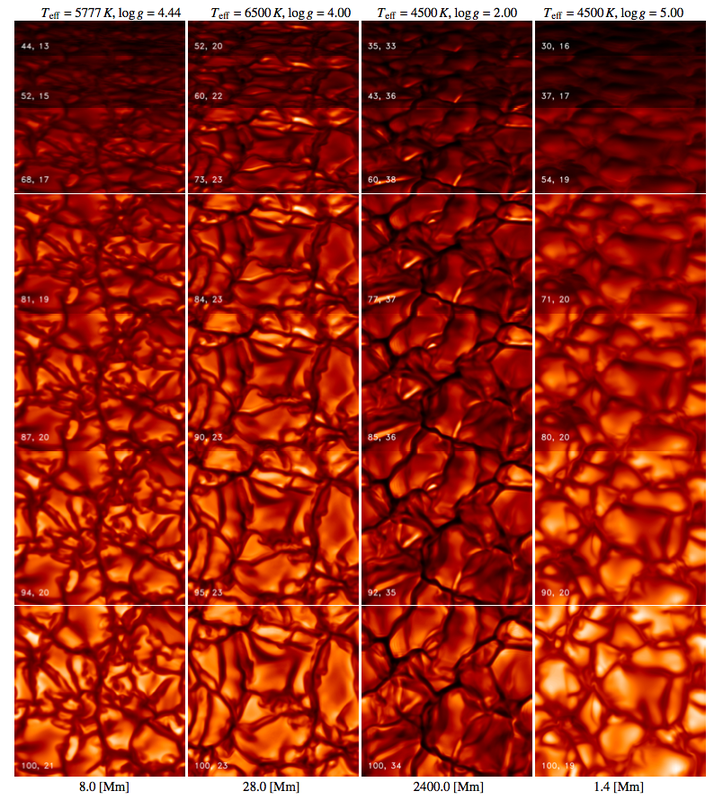 Intensity maps with increasing μ angle from the limb towards the disk-center for four simulations: Sun, turn-off star, red giant and cool dwarf. Towards the limb of the stellar disk, the intensity reduces, which is referred to as limb darkening. These can be accurately predicted by 3D RHD simulations due to their inherent higher realism. The key aspect are the better temperature gradients in the photosphere, leading to improved limb darkening predictions. Usually, the limb darkening is matched with a 4th order power law function. Exoplanet transits predictions for stars with different effective temperature (4500-6500K) shown in the Kepler filter. The main application for the limb darkening predictions are transiting exoplanets. When a planet crosses the stellar disk, the brightness of the parent star is reduced. Theoretical transit light curves can be compared with observations, thereby, deriving details on the mass and inclination of the exoplanets. We have calibrated the limb darkening coefficients for several standard photometric filters, and be retrieved from table.dat with the Readme for explanations. If you use our data, please refer to Magic et al. 2015b for reference. If you use our data, please refer to Magic et al. 2015b for reference. Now, unzip the files, which contain IDL save files for the individual models. The mmd structure contains the wavelength and flux for 10 different μ angles and the disk centre.